Pre- and post-Infinite Crisis, DC Comics has tried to revitalize its science-fiction and supernatural genres with a string of mini-series set in each realm. Countdown to Adventure, with the eponymous "Countdown" in the title, is both a pre-Final Crisis crossover book and the latest of these science-fiction series (following Mystery in Space)--but it's also a subtle, moving epilogue to Animal Man, Starfire, and Adam Strange's space adventures in 52. Writer Adam Beechen's Countdown to Adventure, I'd say, is a "thinker"--I finished it, pondered over it for a while, and found more and more meaning in the story as I thought it over. Countdown to Adventure essentially takes the end of the space heroes' saga in 52 and then says, "Now what?" Whereas other 52 heroes like Renee Montoya and Booster Gold better achieved their own potential during 52, the space heroes struggled simply to survive; their changes were more insular, learning to rely on one another, than empowering. Countdown to Adventure finds the space heroes now necessarily separated--Adam Strange back on Rann, and Animal Man drawn back to the responsibilities of his family--only to find they're not necessarily sure how to survive without one another. I felt initially disturbed that Beechen makes some waves in Animal Man Buddy Baker and his wife Ellen's historically model marriage, but I quickly came to understand the necessity of these waves. Buddy, like a soldier returning from war, feels no one can understand what he's been through except his fellow soldiers--in this case, the beautiful alien princess Starfire now living in his home. Beechen pits Buddy's growing reliance on Starfire against Starfire's burgeoning independence--in the absence of her powers, Starfire makes an attempt at a "normal" life--and there's great story power in the contrast of the two characters' arcs. By the end of the story, both heroes' lives return to the status quo, though Ellen ends up helping save the day in a way that might encourage other writers to give her a larger role in Buddy's adventures. Beechen impressed me also in his use of Adam Strange. Though I can't stand that Beechen (or perhaps DC Comics Editorial) put Adam Strange back in his old fin-head costume instead of the new spacesuit that Pascal Ferry designed for Adam Strange: Planet Heist, I did think Beechen picked up on an important and previously untapped aspect of Strange's character. Adam Strange is essentially part of the bourgeoisie of the planet Rann--a vaunted hero and married to the daughter of the Rannian high muckety-muck Sardath; his feet, even without his jetpack, don't ever really touch the ground. Beechen turns this into a point of contention between Strange and the Rannians after Strange is stripped of his heroic title, and I felt we really learned new things about Strange as he had to face his own position of privilege. 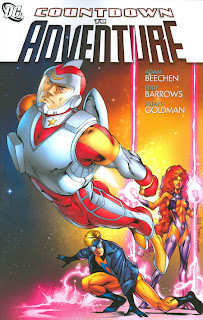 The end of this book brings a change for Adam Strange that I hope other stories will use as well. Adam Beechen brings the 52 space heroes to such a good conclusion here that it seems, in a way, like the end of DC Comics's space saga for now. Fortunately DC's got Rann/Thanagar: Holy War right around the corner; I haven't heard the best reviews about the next series, but I for one am glad DC's cosmic renaissance hasn't ended just yet. Nice work here from Beechen, who brings the same level of excellence as he did in his run on Robin. Back now to some Superman/Batman, and we'll see where we end up from there. Thanks for reading!